Millennials, the hyper-connected, notably transparent, and tech-savvy generation has made a significant impact on society by engineering the social media age, redefining social activism, and, thanks to crushing student loan debts, made it cool to live with your parents well into your mid-30s. As the first generation to grow up connected to the world, millennials crave cutting-edge technology at their fingertips, and they are increasingly utilising offbeat communication channels for getting work done. Brainstorming, idea generation, follow-ups happening over WhatsApp groups – who would have thought of that just a decade back? While there is no concrete time period for millennials, the accepted timeline falls for those born between 1982 and 2004. You’ve likely heard the statistics, by 2020, millennials will make up 50% of the global workforce! Millennial turnover costs the U.S. economy $30.5 billion annually (Gallup). 78% of Millennials say workplace environment affects their decisions to stay at a job (RingCentral). In short; currently, millennials are not overly engaged, they’ve got one foot out the door, and they’re costing businesses a ton of money. But, keeping them engaged and retained is highly linked to career growth, communication, and training and development. The truth is, millennials get more done than any other generation, and it is because they have embraced the technology that is available to them. It’s easy to assume that because a millennial has their head down and is holding a tablet or smartphone, they’re playing a game or browsing social media. But there’s a very real possibility that they’re getting work done – even while they’re waiting for their coffee, their train, or the elevator. Employee Engagement is a vast topic with specific considerations for every organisation and sector. At Clarity International, we’ve carried out engagement campaigns for clients of all sizes. This can be done via digital communication activities, transforming their learning programmes, or the development digital workplace initiatives. We often hear that millennials typically seek workplace benefits such as flex time and a less structured schedule. But, the technology is readily available for the creation of a virtual workspaces, and in some cases, it’s free. Be it Skype, Slack, Office 365, or even SharePoint solutions, the days of the cubicle, and even the open office, are steadily becoming a thing of the past. The same is true for cloud technology. As the fastest growing demographic, millennials lean heavily toward public cloud adoption and innovative technologies, and they expect their employers to provide them with the flexibility and creative liberties to do their work. Millennials believe innovation is critical enough that they will take risks to achieve it, a great deal more risk than that of their Generation X and baby boomer counterparts. Finally, and as we’ve covered previously, Internet of Things will see a major adoption in times to come and it is believed will transform workplaces in a major way, in particular the way learning takes place. From 3D printers to smart wearables, all will transform the way employees work and how tasks are completed, boosting efficiency, productivity and cost savings. Throughout our years as a leader in the consultancy for the development of Sales Tools, Digital Learning, and Employee Engagement solutions, we’ve often seen hesitancy in the eyes and the voices of company “decision-makers”. At the core, it’s all about the resistance to change. 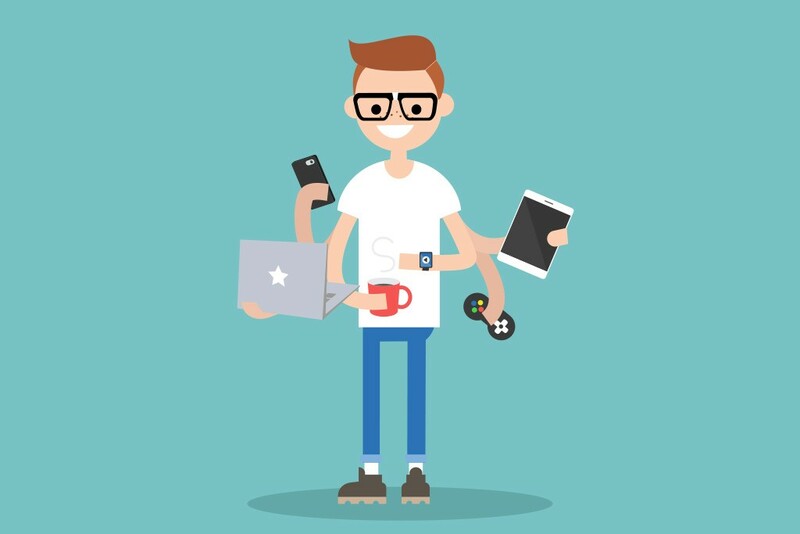 On balance, one of the great traits of millennials is that, if you’re about to implement a new system, software, or process they’re the ones who can learn it quickly and will pick up any slack from the rest of the “old guys”. Millennials have actually learned to expect change; they learned to anticipate working in chaos but what’s more, they learned how to adapt and problem-solve. In order to nurture their growth and commitment to the company, it’s important that you provide opportunities and the tool to be themselves and thrive. This starts with freedom, trust, and, most critically, knowledge sharing. While knowledge is powerful, sharing information is the true source of power because it enables others to act. By harnessing the technological resources at their fingertips, millennials are able to multitask throughout the day, increasing their efficiency on every project. There’s a whole crop of awesome, and often untapped, talent just waiting to be let lose. Companies are investing in usability studies to boost Employee Engagement. If you want to learn more about how we’ve helped clients such as BT, TEVA, and Alcatel-Lucent boost their Employee Engagement, have a look at our Case Studies.